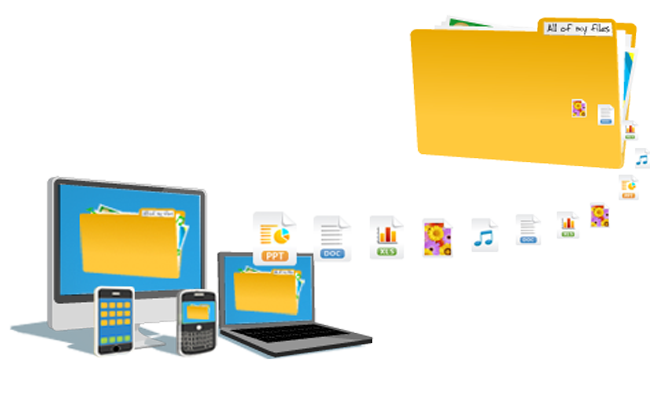 Top 5 ways to transfer and share large files. Transfer of files may be hectic, when huge sized files exceeds the transfer limit. This often happens when we attach the files with the mail and an error come that “the file too large”. The web mail providers like Gmail, Yahoo, Hotmail have limit of attaching the files and get it transferred at other end. There is even a limit if you get a paid email hosting apart from the free email hosting providers. For example, companies like Rackspace provide you with 10GB web mail space and 50MB of mail transfer limit in their paid plans and am sure there might be many provider who may have more of such plans for the customers. When you fail to send large files in your mail, the best way is to bookmark my blog and visit this article. There are many providers who gives you a option to transfer the files. The upcoming cloud service makes it simple. The files are saved on the service provider’s server and you can easily download by clicking on the provided link. This make the transfer of files more simple and easy. Check out the list of options to transfer large files. 1. Dropbox: This is a good option of transferring files. But I do not suggest you to use Dropbox when file size is more than 100 MB, because it limits to the uploading speed of files when it notices large files uploading in bulk. Yes, I recommend Dropbox to share files when it is configured in your machine and it is the easiest way to right-click on the folder to be shared and select specific people to be shared with. 2. Sendspace: This is a very popular file transfer website. This website allows you to upload file via web. This site has a limit of 300 MB of file upload size. You do not have to do the login and upload the file directly by mentioning the recipients and your Email ID. 3. Ge.tt: Is another provider which helps you send files on real-time basis. You can easily get it installed in your Google Chrome browser and start using with mentioning the email ID of the recipients by dragging and dropping the files. Ge.tt supports up to 2GB of data file transfer. This is a browser-based file transfer service. 4. Largefilesasap: This service is similar to sendspace, but the main difference is about file transfer size is 2GB. It also does not require a mandatory authentication while sending a large files. The limitation is that you can share files with only one user at a time. 5. Wetransfer: This is a service which I often recommend my friends. It allows file transfer up to 2GB. Wetransfer is a flash-based setup. One thing to be noticed is that it always use a secure gateway by HTTPS. You can upload file up to 2GB and send it to maximum 20 users at a time. Please Note: I am sure most of us don’t delete the file which we have uploaded on various file transfer servers. But you may notice that when the file is completely uploaded and you receive a mail of the link to get the file downloaded, at the end of the mail file transfer providers even send a link which deletes the file. So request you to delete the file once the use is over and free up the servers. It is also a good practice to keep the things more secure and safe. « Mozilla brings Firefox to the Android users.